Here you will find information and photo galleries of our entire current vehicle fleet. 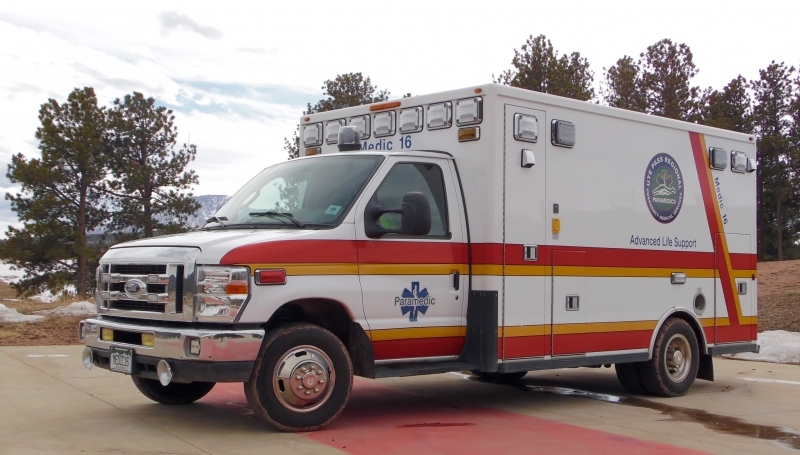 The ambulances that have been re-powered have had rebuilt or refurbished engines installed, transmissions rebuilt, and major suspension components replaced. Two of the older ambulances have also has cosmetic repairs and new paint and graphics on the exterior and new upholstery on the interior. We have grouped the information by our two stations that the vehicles operate out of. Second oldest truck in the fleet. Currently first out for inclement weather in Woodland Park. Repowered mileage 175000, current mileage 235000. First out rig in Woodland Park. 2 wheel drive, new concept custom interior. Dual onboard oxygen tanks. First out in summer and for interfacility transports in good weather. Backup rig and second out in Florissant. All original, has not been repowered or had major mechanical upgrades done. Current mileage 180000, new engine at 176000. First out rig for Florissant. Has an onboard refrigerator for medications and dual onboard oxygen tanks. Also has air ride rear suspension for easier pt loading and unloading. The Affordable Care Act changed the qualification standards for Medicaid allowing more people than ever to qualify for it. In our district alone we have seen a 200% increase in the Medicaid population. Many of these patients would in the past have established a payment plan. But today the district is only able to recover around 10% of the total amount billed to these patients. This is a fraction of the cost for providing this care.